Freeze extra fresh herbs to enjoy during cold months. Preserve your fresh summer herbs, such as basil, oregano, cilantro, rosemary and thyme, into the winter by freezing them in ice cube trays. You can also use this technique to store leftover herbs that you chopped and didn't need for a recipe. Fresh, store-bought herbs can be costly, so freezing them is an ideal way to save money and be able to enjoy the savory flavors in another dish. 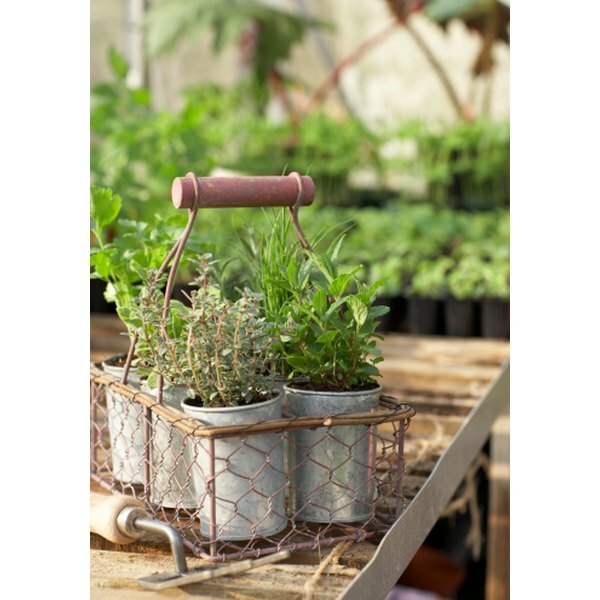 If you have small portions of several herbs, combine them in the tray to create customized combinations. Finely chop the fresh herbs into small pieces by hand using a sharp knife or in a food processor. Fill half of each ice cube tray well with the chopped herbs. Pour a desired liquid, such as water or chicken or vegetable broth over the herbs within a 1/2 inch of the top of the wells. Place the herb-filled tray on a level surface in your freezer and freeze the cubes for two hours, or until the liquid is solid. Remove the tray from the freezer and gently twist the tray to pop the frozen cubes out of the wells. Transfer the cubes to a heavy-duty freezer bag featuring a zip-lock seal. Remove excess air from the bag before sealing it. Create a label featuring the type of herbs using a piece of freezer tape and press it onto the bag. Store the herb cubes in your freezer until you are ready to use them.